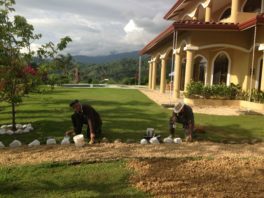 For home owners in the Bahia Ballena area of Costa Rica (southern pacific zone), it is a constant challenge to keep ahead of the yard and landscaping. I'm originally from the Midwest, United States, where grass grows for half the year, and the other half it is covered in snow. Here in Bahia Ballena, in the wonderful and beautiful tropical rainforest region, plants, grasses and ornamentals grow 365 days a year. The size of a lot is an important consideration when purchasing a lot in this area. The normal thinking is typically that "bigger is better" when it comes to purchasing a home lot. However, please keep in mind that some trees and plants will grow over two feet a month here in Costa Rica! !